Zambeza’s XL autoflowering version of the ever-popular Northern Lights definitely doesn’t carry her name without good reason. This autoflower will bring bombastic yields to the table, along with other great Northern Lights qualities like her excellent blend of flavours. She sure doesn’t need to hide from her feminized sisters because she will grow almost as tall despite being an easy autoflower! Cannabis lore tells us that the first Northern Lights had been created from 11 different seeds at the US West Coast back in the mid-80s. The new creation displayed some truly extraordinary qualities, which explains why it didn’t take long until she took the cannabis world by a storm and became one of the most popular varieties which she still is today. Zambeza presents to us their Northern Lights XL Autoflowering where they managed to improve her even more, giving us an autoflower that grows as tall as a feminized variety, easily and fast with some superb yields. If you grow Northern Lights XL, you can expect some good yields of 350-400g/m² in a life cycle of 60-70 days. What sets Northern Lights XL Autoflowering apart from many other autoflowers is her impressive stature. With a height as tall as 120-150cm when you grow her outdoors and yields of up to 230g per plant she should erase any doubt why she carries the “XL” part in her name. This grand autoflower is perfect for almost any growing environment and thanks to good genetics she doesn’t require any special cannabis growing skills either. On paper, her 14% of THC may not look too impressive but don’t let her moderate THC content fool you. Thanks to the stellar indica genetics she’s potent enough to make for a superbly relaxing stone that comes with a nice happy feeling, a great smoke for any time of the day. Her flavour is equally top of the line. She gives a very smooth smoke that nicely blends subtle tangy citrus aromas with sweet and fresh tones. There is a reason why Northern Lights has become one of the most popular indicas today. Just enjoy the pleasant effect and great flavour of Northern Lights Xl Autoflowering and any questions about the excellence of this strain should be answered! Northern Lights Xl Autoflowering by Zambeza is a fantastic “BIG” Northern Lights autoflowering variety that absolutely won’t disappoint. 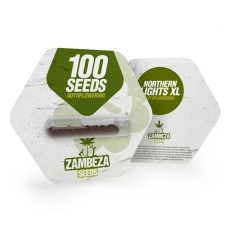 You can normally not go wrong anyway if you love indicas and grow Northern Lights, but Zambeza’s version comes as close to perfection as it can get. This makes her a perfect choice, even for new growers who want an easy-growing strain but don't want to make any compromises. Northern Lights XL Autoflowering is available in packs of 100 seeds so you can stock up on larger quantities of this superb and highly rewarding autoflower.